So, during my break between classes I made time to read the Astronomicon Minorem, the foundational holy unholy book for the First United Church of Cthulhu (FUCC). Although it didn't take me long to read, roughly an hour and a half if even that, I really felt the love and detail put in this new scribed sacred tome. The authors seem to have a similar background and spiritual journey that I have, in that, they've studied some off-beat spiritual teachings alongside those which are far more ancient and esoteric in nature. It makes for an interesting balance in the literature which is a combination of DMT research, historical interpretations, poetry, classical art, and structure detail as it pertains to the FUCC. You get the feeling that this spiritual philosophy is walking that fine line between being absolutely serious and being a lark. I mean, it's the only holy book I've ever read that has the word "noobz" in it, but it also contains some very interesting analysis on H.P. Lovecraft and the Cthulhu mythos. It's also another religion that mixes popular and subculture into it's own sort of mythology in a way that expresses the feelings of FUCC and what it represents. I have my own opinions on that, but that's not entirely important since the fun of books like this is interpreting the data to your own core values and personality. What I think I love most about this is the presentation of the book itself. The cover art is absolutely stunning, and the pages are laid out in a zine or indie comic from the 1990's kind of way. This is the kind of literature I used to find in comic shops near the Fangoria and Famous Monsters magazines. Dynamic, expressive, and even creeping with personality. The selections of drawings and painting in this book are simply inspired. Some of them I would have never associated with Lovecraft or Cthulhu but they totally fit that sort of dark aesthetic. The esoteric information within the Astronomicon isn't where my mind tends to go when I think of the Cthulhu mythos, but it's a fine interpretation as any other. Some of the descriptions I will have to mull over for a while and see if I can understand it from the FUCC point of view, or if I can connect it to my own. Without question, there's good stuff here, but I feel like I need a bit more context to understand it all. I probably have to read more of the recommended Lovecraft stories to really get it, which I am more than happy to do. I'm really happy I picked this up and made contact with FUCC. I've been exploring Cthulhu mythos spirituality for a while, trying to understand its abstract and gruesome nature, and after reading this I definitely have a greater view of it all. 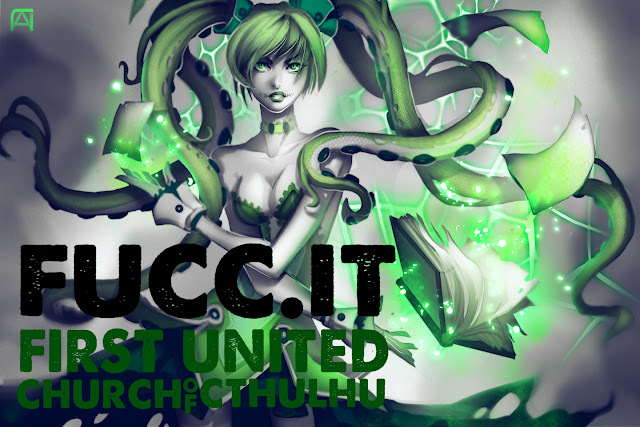 Click the book cover image below for ordering information, and click the image beneath that to find out more about the First United Church of Cthulhu.